The High Airflow Filters (HAF) are able to operate with twice the efficiency of washable foam filters, due to High AirFlow Filters being electrically charged. Due to the electrical charge, the HAF filters attract, capture, and retain more water particles. A HAF filter's open channel structure has minimal airflow resistance so that your Dri-Eaz Evolution LGR dehumidifier processes the maximum amount of saturated air. With these filters, you get maximum water removal (on your very clean coils) and maximum airflow to handle more volume. 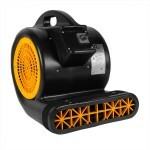 Please feel free to check out our full line of dehumidifier accessories & filters for other options. This is a review for the Dri-Eaz® Evolution® LGR Dehumidifier Filter (pack of 24).